A carrier with Boeing EA-18G Growlers from Whidbey Island Naval Air Station is en route to assist with air strikes against the Islamic State in Iraq and the Levant. The USS Carl Vinson strike group, which includes Electronic Attack Squadron 139, replaces the USS George H.W. Bush carrier strike group, deployed since Feb. 15, according to the Navy. NAS Whidbey-based VAQ 134 has been a part of the departing strike group, and the squadrons involvement will be the Navy’s final job for the Northrop Grumman Prowler. 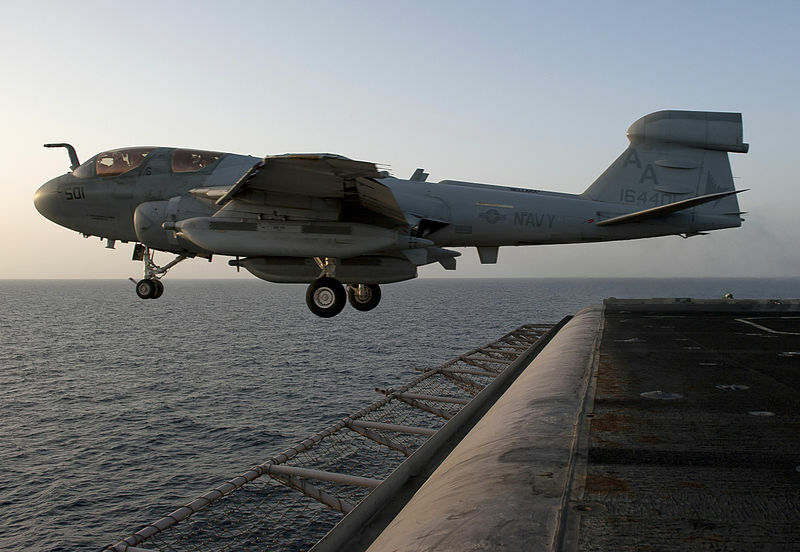 “This is the final Navy EA-6B Prowler deployment, and that, despite its age, compared to the modern EA-18G Growler, the old Prowler, thanks to its dedicated maintainers and air crew, is proving itself right up to the end,” said Lt. Joseph Hontz, U.S. 5th Fleet spokesman. For the complete story by Janis Reid of the Whidbey (Wash.) News-Times, click here.